Greta Ljung & Martin Hedenstöm Ljung from Swedish Studio Ljung & Ljung travelled the world and created these wonderful luminaires. POP combines a Scadinavian minimalistic shape with a fresh edge given by waved bamboo stripes. 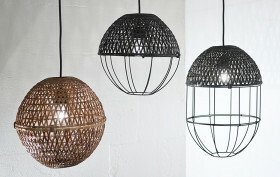 Produced in Thailand, they offer a sophisticated take on paper Chinese lanterns.